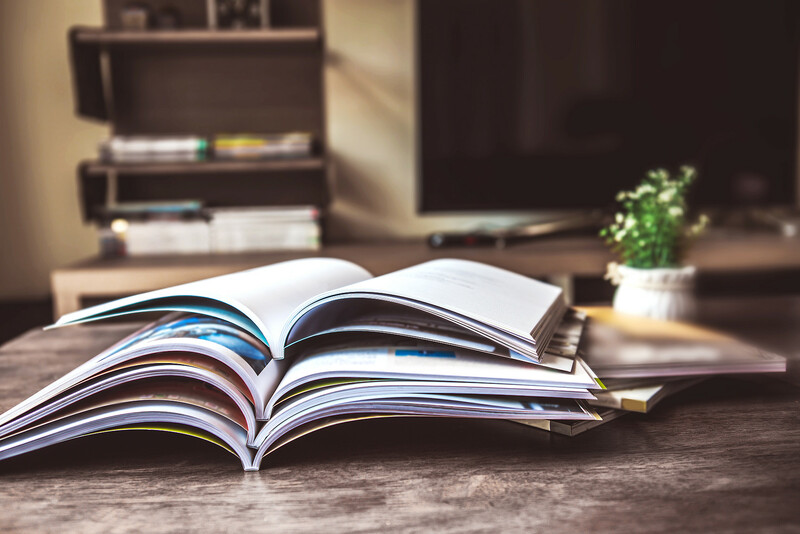 For software publishers, distributing the right licenses to their users is one of the most important steps in the entire sales process. The procedure needs to be simple, secure and transparent. No more than a few clicks should be required for the user to have the license on his or her system. At the same time, the independent software vendor (ISV) wants to immediately see how many licenses have been sold and how many are active on the user’s side. This needs a perfect integration between the back-office systems used by the ISV and CodeMeter® License Central, the comprehensive license management solution for all the software vendor’s needs. The market for CRM (Customer Relationship Management) and ERP systems (Enterprise Resource Planning) is an embarrassment of riches with the many different solutions offered by SAP, Oracle, Sage, Microsoft, and other providers. Many ISVs also rely on their own, home-grown applications for the purpose. Among cloud-based CRM applications, Salesforce has long been one of the market leaders – which is why we’ll take a closer look at how CodeMeter License Central (Internet Edition) can be made to work with Salesforce in just a handful of clicks. 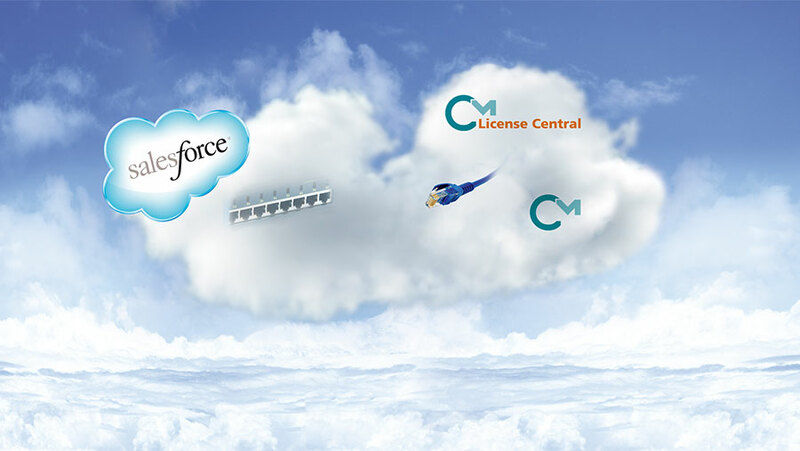 License Central gives ISVs the full versatility of the licensing solutions made by Wibu-Systems right in Salesforce and combines the advantages of both systems in a perfectly designed Web service. For this purpose, CodeMeter License Central is automatically integrated to create license requests for the customer’s data, which is kept on Salesforce via a dedicated SOAP interface. These requests include one or more licenses for the customer and are identified by unique ticket IDs. For each request, the ticket is sent back to Salesforce, before it is delivered to the customer by email or a delivery slip. The user retrieves his or her licenses for this ticket via the ISV’s web portal (License Central WebDepot) or directly from within the software. Which edition of Salesforce.com works? Salesforce. These two editions include integration capabilities via the Webservice API, which is needed for the automatic integration of CodeMeter License Central via the SOAP interface (see P1). Which changes need to be made in CodeMeter License Central? For CodeMeter License Central to create new requests and generate licenses, it only needs the addition of the required item. The item is identified securely via a defined Item Id, which Salesforce must know, and which is transmitted as a parameter when the web service is accessed for the automatic creation of a new request (see P2). Which changes are needed in Salesforce.com? 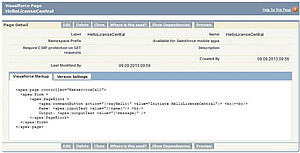 Customer’s information to allocate the request and the ticket in CodeMeter License Central to a specific customer in Salesforce. 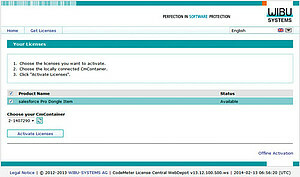 Product information that CodeMeter License Central needs to generate the right licenses. Additional fields are required to identify the request generated in CodeMeter License Central, and to store the resulting ticket. This ticket allows the customer to be authenticated and to retrieve the actual license. 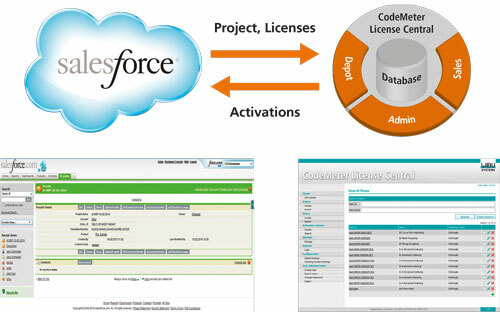 One basic action that is needed is for the Web service that connects CodeMeter License Central with Salesforce to be made known in Salesforce. For this purpose, it needs to be entered and set up as a remote site in the Remote Site Settings in Administration Setup > Security Controls (see P3). Finally, a few lines of VisualForce markup code need to be produced for the Web service of CodeMeter License Central to be accessed by Salesforce with the right parameters for creating the request. As a result, the Web service returns the ticket to Salesforce (see P4). Now a new request can be created in CodeMeter License Central directly from Salesforce. The resulting ticket is made available for further use, such as its delivery to the client by email or as a Ticket ID on the customer’s delivery papers. How do the licenses reach the customer? It’s not until the last steps of the process that the customer comes into play. 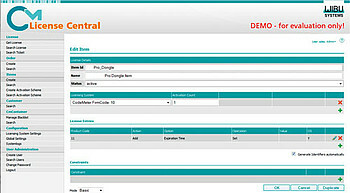 The customer retrieves the licenses by using the created ticket (e.g., via the License Central WebDepot). The licenses are copied to a CmStick connected to the user’s PC. If the ISV chooses to use software-based licenses, the customer can activate these directly on his or her PC by following the same route (see P5). Combining CRM or ERP systems with CodeMeter License Central allows the professional distribution and monitoring of licenses. Comprehensive Web services allow the entire license administration and activation functionality of License Central to be integrated into an already established back-office system. This sample based on Salesforce shows that this is not only the case for familiar in-house systems like SAP or similar options, but also for cloud-based solutions. All systems that allow the integration of Web services can integrate the license management functions transparently and with little effort. And if you need some help or don’t want to do it yourself, our Professional Service Team is always available to help you achieve this goal.